UV30 is a UHF VHF jammer that is used as the desktop solution for protection against low frequencies and wireless threats related to them. Among the threats it can prevent you will find CCTV cameras watching you every day on the streets of the city you live in, RFID chips which are placed in..
UHF and VHF are low frequency bands (140-180 MHz, 450-480 MHz) used by many electronic devices we use every day without even thinking about it. For example, security walkie-talkies use these frequencies to operate. Two-way radios, made by enthusiastic kids of your neighbors to talk to each other while hiding out in their basements, are also use UHF and VHF frequencies. But not only low frequency radio communications work with the help of those signals. If you want to jam these frequencies you will need a strong desktop UHF VHF jammer. If you live in a city, especially if it is huge megalopolis like New York or London, you have probably noticed surveillance cameras. They are everywhere: at the traffic lights, lamp-posts, mounted on the walls and under the sun breakers, etc. Those are CCTV cameras. They use UHF/VHF frequencies in their work. In these latter days governments of many countries have started to install CCTV cameras in many cities. If you think that CCTV cameras violate your privacy rights you can use VHF UHF jammers (CCTV jammers as well) to avoid being spotted by CCTV cameras on the streets of any city. Another implementation of low frequency bands is their usage in RFID microchips. Those tiny electronic things are used in many ways. For example, when you buy food at the mall or grocery store, all food there is marked with RFID microchips with different frequencies used inside each one. When you visit any governmental facility, you get a visitor badge with RFID microchip inside. Using NFC technologies, safeguard service of the facility can track your movement inside the building. By the way, if your smartphone is NFC-enabled, they probably do not even need a visitor badge on you because your smartphone will be the object they can track. Smart home systems are also use RFID microchips and NFC technology as part of their technology, so you are at risk of being tracked in your own house. 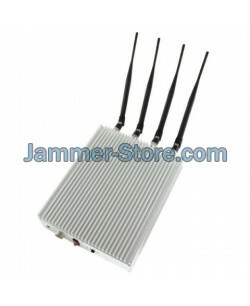 Still our RFID jammers which you can find in this category can easily protect you against all those threats. Moreover, these devices can also block LoJack tracking that uses low frequency bands to find your location, but there are specialized devices made for that. They are called LoJack/XM/4G Jammers, and they have many other appliances aside from LoJack tracking prevention.